This week we had two soups. 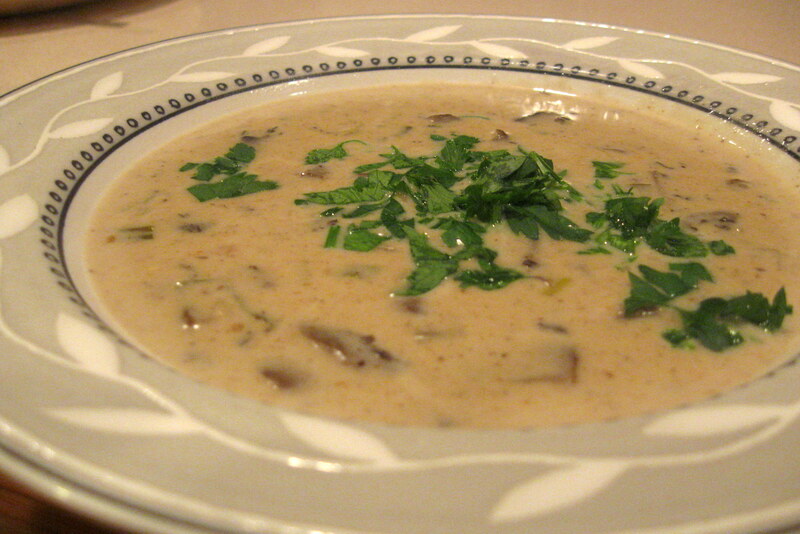 This one is a nice, although not dramatic, improvement of the basic cream of mushroom soup. It’s based on the epicurean recipe with some adjustments. How to make: Heat the butter. Saute the chopped onions and the spring onion or leek. Add the mushrooms and continue sauteing for another 5-8 minutes. Stir in the flour. Add the chicken stock. I didn’t 🙂 When I made the beef bourguignon the other day I served the meat but saved the liquid: red wine with beef stock wonderfully flavored from the veggies and the meat. I’m not saying you should make beef bourguignon first but I wanted you to know. Back to the recipe. Lower the heat and simmer for about 10 minutes. Add the heavy cream. Add salt and pepper to taste and cook for another 10 minutes. The soup should have a nice creamy texture. Notes and tips: If you have to save it in the fridge for the next day, the soup will thicken substantially. It’s not a crime to add some milk or water and reheat.